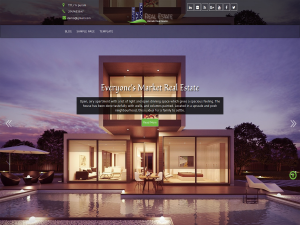 The exclusive Realestate WordPress free theme offers you , an ideal solution for real estate agents, real estate brokers, builders, woodworkers, contractors, inventors, interior designers, architects, plumbers, painters, or anybody who is interested in building construction or in realestate business websites. Though it mainly occupies the realestate area, It can be used for repair, renovation, roofing business, construction landing page etc. This theme has been crafted carefully keeping in mind the latest web design standards. It offers a dynamic customizer with multiple theme options, to bring out the design of your website as per your wants. This minimal WordPress theme is built on Bootstrap that makes it highly responsive and cross-browser compatible. Being a mobile-friendly theme, it gives a cutting-edge performance on every screen size. It has secure and clean codes that are in accordance with WordPress web standards. To match the style of your business, it offers eye-catching buttons, beautiful images, sliders, banners, and a lot more under the hood. With social media integration, it powers your online presence. Its SEO friendly nature will make your website reach the top search results. Take advantage of ample of features, functionalities, and an advanced set of customization options to create your own professional real estate business site. Reap the benefits of this free, flexible, and robust WordPress theme now!